Hello! I've returned happy (but tired!) from Colorado, having had a wonderful time! I will write about that shortly, as well as share photos (mountains! mountains! mountains!). 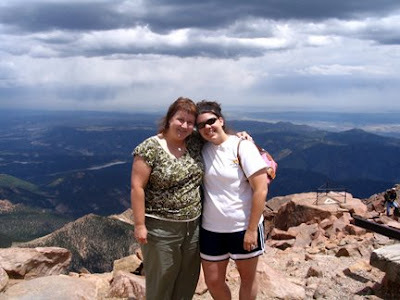 To whet your appetite (or make you nauseous, depending): My niece Sam and I on top of Pike's Peak (14,110 feet / 4,300 m) in Colorado Springs. I'll keep blogging here, sometimes referring to a post at MLive, and sometimes doing just the opposite. Because I'm versatile. Or contrary. Or something! Congratulations on the new blog Monica. I'll have to pop over there for a visit! I'm glad you had a great visit to Colorado and that you visited the Denver Botonic gardens... awesome. Love your photo on top of Pikes Peak. I'll check our your new blog...what a great name. I like reading your new blog, I just don't want to register, so I will leave my comments here. I am VERY interested in waterwise gardening, since we had huge water problems last year. I am looking forward to see more pictures from you. ich hab auch mal in deinen neuen Blog reingeschaut und er gefällt mir. Da schau ich auch öfters mal rein, aber registrieren möchte ich mich auch nicht. Schön das du so eine schöne Zeit in Colorado hattest mit deiner Nichte.